The mystery of the wobbly string. As mysteries go, this one didn’t last long. The peculiar whip like action of the bowstring noted in the last posting, is all the result of limb bounce. Thankfully the bolt is long gone by the time these perturbations set in. Four of the new style bolts are under construction, compacted newspaper for a better target has been acquired, and a new more robust bowstring is in the works. Stay tuned for some preliminary high power tests next week. The 4700 lb. Warn electric winch showed up yesterday. I had sworn I had dug my last ballista bolt out of the catalpa log, and would wait for a bale of compressed newspaper to use as a target. As it was, it proved impossible not to give the new winch a try and so after today’s testing my supply of the heavy old bolts for the Gallwey are pretty much gone. Just as well too. I am eager to try the new Dura Europos style bolts as soon as I get some made up this weekend. However, we did get off three 3 decent shots today. They tabulate as below. Bolt weight Velocity Energy Draw length Draw lbs. First shot 5015 grains 249.1 fps 690.85 ft/lbs 47″ 2600 lb. Second shot 5015 grains 244.3 fps 664.48 ft/lbs 47″ 2600 lb. Third shot 5015 grains 244.0 fps 662.85 ft/lbs 53″ 3050 lb. It became apparent after the third shot that the bowstring had stretched out a fair amount. (Click for video, stretch). That would explain the drastic drop in relative power of that last shot, given that it was drawn back 6″ further than the first two. Probably the expedient bowlines I had used to form the loops had crept a tad. 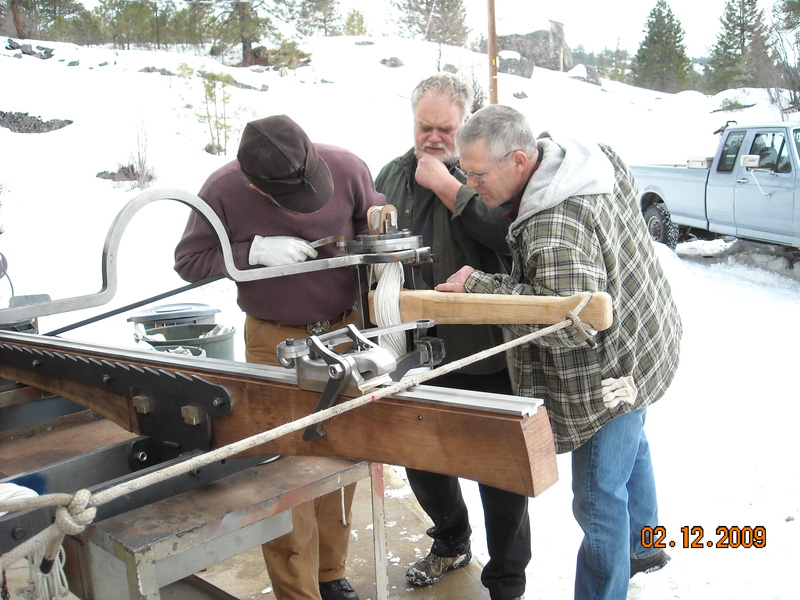 We will try it next time with timber hitches for the loops. A locked splice, as was used on the Gallwey, might be best, but for now we are just getting a feel for how the machine performs under load. There are many tuning parameters to be explored, not the least of which will be to tighten the bundles again. If this machine is anything like the Gallwey, there will be several cycles of shooting and tightening before the stretch in the bundles is stabilized. With the Gallwey, the bundles finally achieved a state of equilbrium, and no further tightening was needed for the last 100 shots or so. It is still a question as to whether the extra rotation of an inswinger will cause problems with spring memory, and thus affect consistent velocities. The following video is rendered in slow motion. The sine wave that forms in the bowstring as it snaps out at the end of the shot is an interesting phenomenon. Is this because the string is too loose? Or is this simply a characteristic of an inswinger? Just more stuff to investigate. With the new chronograph up and running, here are the results from a couple of preliminary shots made this morning. The bolt we used is left over from the Gallwey project and not really ideal for the Orsova machine. When we get around to making the lighter Dura Europos style bolts, velocity should increase quite a bit. The data below is from half draw so it’s pretty low power stuff. It is just a sneak preview of a long series of higher power tests that will be performed soon. Yes I know, the quality of the videos is terrible, but even with it you can see that the frame of the machine shows no sign of vibration or movement during firing. This is probably the best news yet as it promises good accuracy in the future. The maximum draw of the Orsova reconstruction is 63″ and testing at that level will have to wait for the electric winch to show up. It will allow us to go to the higher power levels with some measure of safety. A remote control for the winch has also been ordered so we can stand behind cover when a limb breaks (yes, something will break eventually). If we extrapolate a geometric increase in power from these two data points, full draw should put us at about the same power level as the Gallwey reconstruction with its massively bigger springs. If the power rises exponetially, perhaps it will even exceed the Gallwey. Either way, even these half draw tests indicate that the Orsova inswinger could develop plenty of power with its much smaller springs. The sinew ropes the ancients preferred for their ballistas must have been hard to come by. Being perishable, labor and resource intensive, and in high demand for many applications, sinew rope was surely a valuable commodity in ancient times. If the inswinger design could have allowed the Romans to make powerful torsion engines while using less sinew, that would have been a big logistical advantage in a far flung empire. Zippyish Orsova bolts. New video. The new spanner for tightening the bundles worked like a charm. We now have total control over how to put pre-load into the springs. More on that in a moment. For now, here is some video of the Orsova reconstruction shooting a 3/4 lb. bolt at half draw into my trusty catalpa round. Considering that we are only at 34″ of draw with 29″ more to go, and the dynamometer is showing 2100 lbs of pull weight, I am starting to think an electric winch maybe the way to go when we get into the high power testing. At least we can be out of the way if a limb decides to go all weak-minded on us. A more authentic hand powered winch can come later. It is clear why the Romans used a full steel backing for their ballista limbs. I doubt that the current set will make it to full draw without breaking. Just looking at them, I am guessing the bolts in the above video are only going around 200 fps. The chronograph arrived today, so we should be able to accurately quantify some of these low power results this weekend. 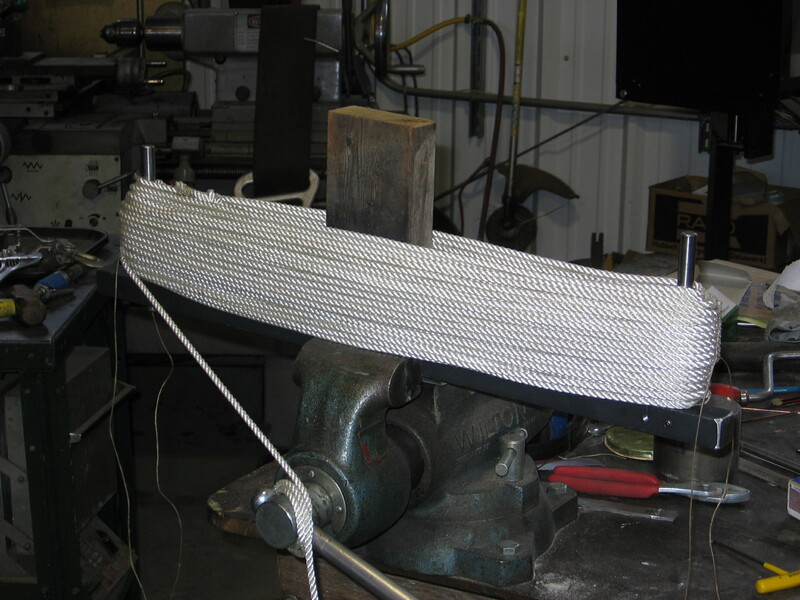 It is interesting to note that in the first field test we stopped at 1600 lbs of pull weight at 45″ of draw length. With the new spanner tightening the bundles with another 15 degrees of rotation, we developed 2100 lbs of pull weight at only 34″ of draw when the above shot was made. Clearly the pre-load put into the springs has a huge effect on the final performance of the machine. More testing will no doubt find a viable balance between maximum power vs. spring longevity. Here is a photo of the new spanner and tightening procedure for the spring bundles. 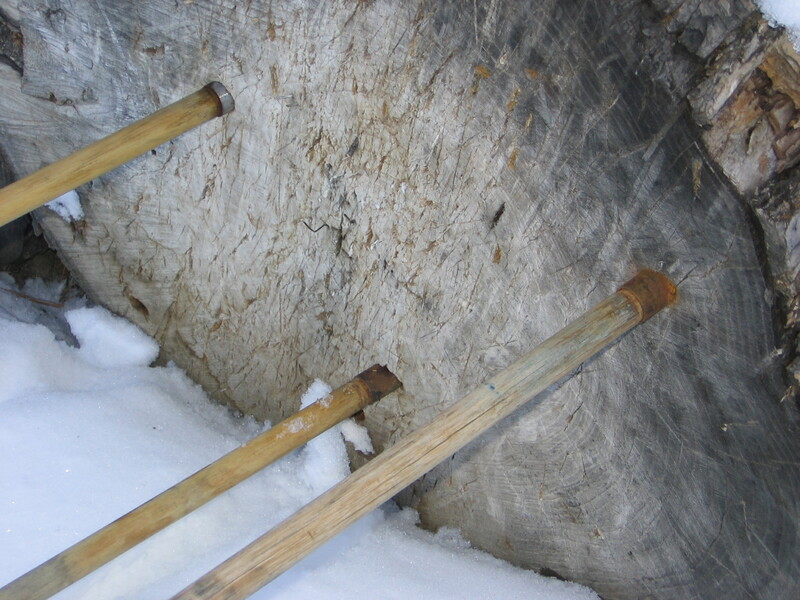 Even though all these shots are on a fairly timid, low power setting, the increased umpff from tightening the bundles can be seen by the increase in penetration into the catalpa log. The two bolts on the right were from field test 1, the bolt on the left is from field test 3, after the new spanner had done its work on the spring bundles. Now we are getting 3″ of penetration with a blunt 1″ tip, rather than the 2 1/4″ we had before. It will be an interesting comparison when we go to the smaller diameter Dura Europos style bolts, with sharp tips, and the machine cocked to full draw. Perhaps not enough to pin an armoured barbarian to a tree yet, but it’s getting there. All torqued up and no place to go. If anything, the second field test indicated the need for a specialized spanner to tighten the spring bundles. 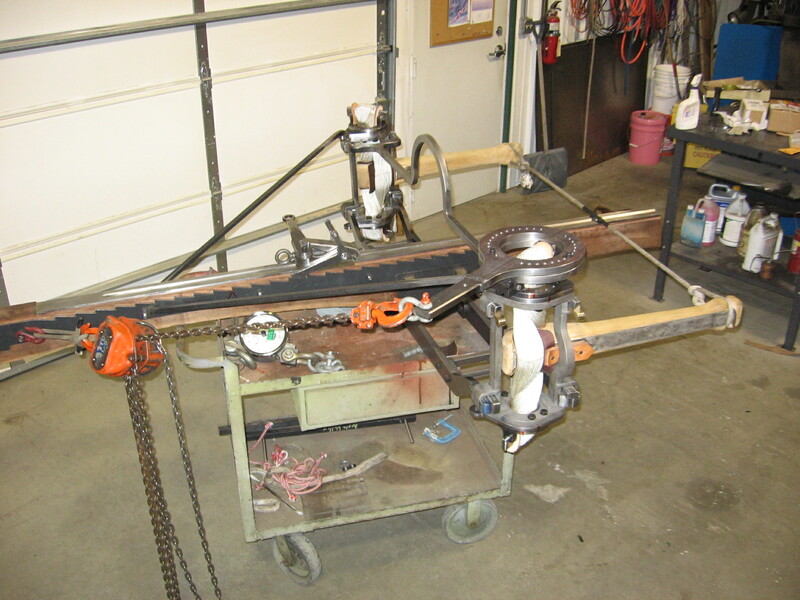 We have been using a 15″ crescent wrench applied to the end of the cross bar with a cheater bar. It takes 3 or 4 stout helpers just to stop the whole machine from rotating as the torque is applied. Clearly this is a clumsy and thoroughly unscientific way of approaching the problem. Some idea of the forces involved can be seen in the following photo. A better approach will be to use the chain hoist attached to the end of the tightening lever and then back to the rear of the stock. When we rig it like that, the dynanometer can be used to measure the force and balance the bundles as closely as possible. After an appropriate spanner has been made, that will be the next job. The second field test ended with a rather wimpy shot. This always happens after the bundles are tightened for the first time. 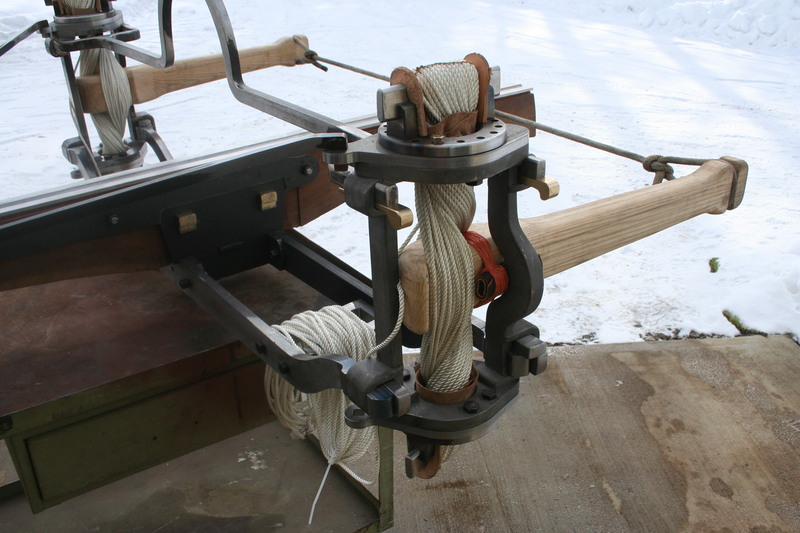 I had added another 22 feet of the 1/4″ spring cord for a new total of 275 feet per side, that is an 8% increase over what was there in the first field test. That operation had left the bundles relatively loose. It takes 2 or 3 cycles of tightening and shooting before all the easy stretch is taken out of the bundles. Only then does the real power begin to emerge. When we started to draw the bowstring back we were able to take some readings of the draw force and it appeared to rise a fairly consistent 100 lbs. per notch on the sideplates. There are 23 notches in all (63 inches at full draw) and we were only able to take it to notch 14 (45 inches of draw) before running out of room with our ad hoc chain hoist arrangement. At that point the dynanometer was showing 1600 lbs. With 9 more notches to go, and in a zone where most of the energy is probably stored, it will be interesting to see what kind of readings we get at full draw with bundles that have settled in after a few shots. A chronograph has been ordered and with a bit of luck some data should start flowing in late next week. 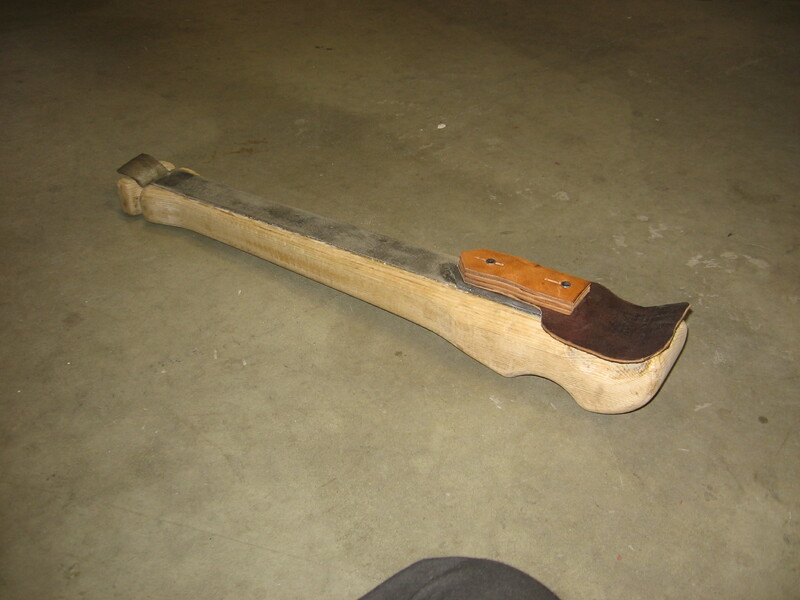 The first set of limbs developed a crack in the first field test and have been drastcically reinforced with a spring steel brace, cross-bolted through to a backing plate. For safety, seat belt webbing has been epoxied onto the back of the limbs and if that doesn’t prove strong enough to stop the limbs fracturing, it should surely be enough to guard against any unpleasant trajectories. A more authentic set of limbs with a set of full length steel braces and steel hooks for the bowstring will be made later when we have a better idea of all the forces involved. The second field test will be at noon tomorrow. Their will be two objectives. First, to test the power from the point testing ended in the first test, and then continue on testing through to full draw. Perhaps five or six shots should accomplish that. Second, to measure pull weight at each power level. Now that I think about it, there is no reason those tasks cannot be performed concurrently…….. what a good idea. The spring steel brace, visible when the chafing pad is lifted up. Not visible are the 3/8″, grade 8 bolts that go through the thickest part of the limb to the backing plate on the other side. 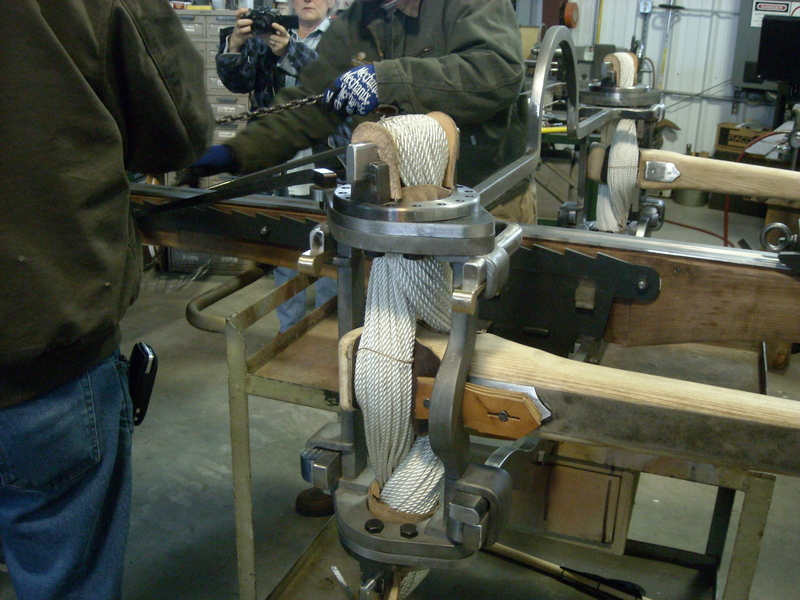 The deep concave depressions in the limb serve to keep the bundle of spring cord in place and prevent it from splaying out and causing clearance issues with the field frame. They also help stabilize the limb by giving the spring bundle some controlled surfaces to grip against. And with the pad down. 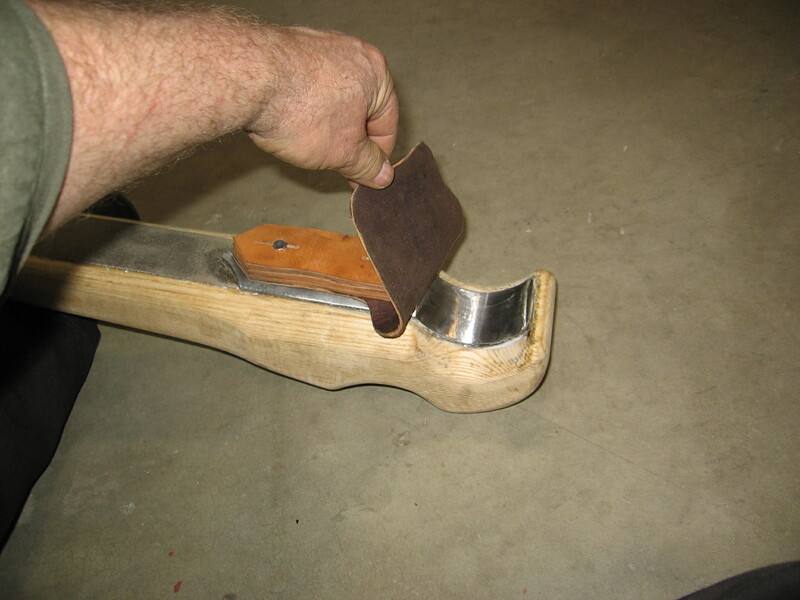 Note the heavy leather strips that form a buffer where the limb will contact the stancion on the field frame. 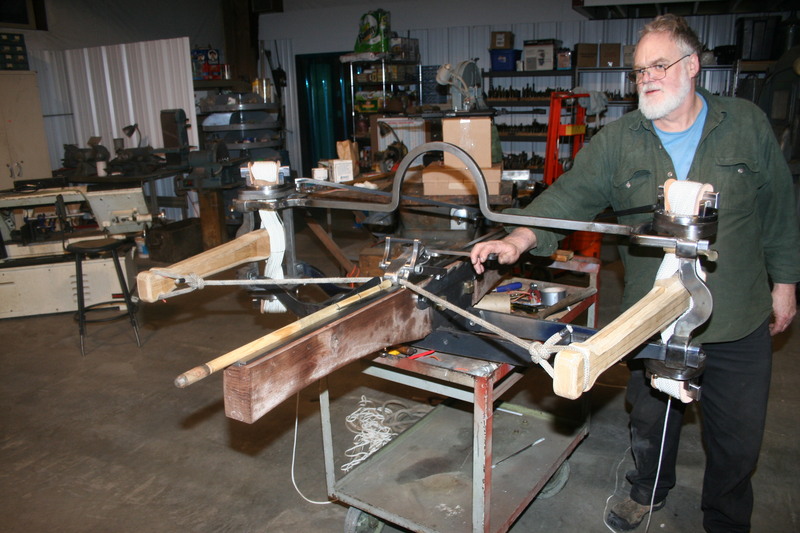 Jig for winding the torsion springs. Note the seam of stiching at either end of the bundle. This was needed to hold the cords in place during assembly into the field frames. The other approach would be to thread the 275 feet of 1/4″ nylon cord around the crossbars and through the holes in the field frame. A profoundly tedious process. I may try it someday to gain a more tightly wrapped spring with a minimum amount of spiral. For now, the jig approach will suffice. Sometimes what you started has a way of catching up with itself, making whole something that before you started , never was. I wonder if this is what having a baby is like. After some fumbling around with the springs, we were able to get off a shot that showed a lot of promise. As can been seen in the following video, the machine was far from full draw when we decided to make the shot. The ash limbs will need to be rebuilt with some steel reinforcement to be strong enough to get them back all the way. Also, the rope bundles for the torsion springs could be about 20% larger and pre-tensioned with more torque. I am convinced that the power seen in the following video is a fraction of what this machine will achieve in the near future. Even at that, it drove the 3/4 lb. bolt with a 1″ diameter blunt tip over 2 1/4″ into a frozen Catalpa stump. Granted Catalpa isn’t a hardwood, but as a medium of comparison, that is very nearly what the Gallwey reconstruction will do with torsion springs that are twice as big. Are we seeing the superior efficiency of the inswinger design starting to emerge here? Perhaps so. The next round of testing will be done with a chronograph to measure the velocity and a dynamometer to measure the draw force. Thanks go to my neighbors and good friends, Scott Morrison and Richard Rough for helping with the shot. Also thanks to Angela Morrison and Bonnie Rough for taking the photos and video. All in all, for a crude field trial, I am quite pleased. Now I am going to sleep for about a week before moving on to stage two: new limbs and an authentic double action winch. Scott and Richard and myself doing some fancy figuring. Almost ready for first shot. In the next day or so, the Orsova reconstruction will fire its first shot. The springs have been installed and the first set of limbs are ready to go. There are so many details to get right, this whole thing is starting to feel like the moonshot rather than some goofball catapult that only a few entushiasts will ever understand the value of. Sometimes I think I must be a little touched to put so much effort into this thing. However, there is no turning back now, and working alone as I do, I must summon all my concentration to make sure this machine lives up to its potential. My thanks to those people that have sent me their comments. It is reassuring to know there are others who may take some interest in how this turns out. The photo below shows some of the progress made since the last posting. Purists can be assured that all the hex head bolts and other signs of modern manufacture will be removed during the finishing stages. Stay tuned. We are just hours away from launch. By the time you reach 56, life has become so choked with memories you start to wonder if the present is nothing more than a timid outgrowth of the past. You can’t wander down to the mailbox and not recall how you pick-axed the road or drilled the well or nailed up the fence, or maybe saw the biggest horned owl ever. This trove of experience ties us to the comfort of days when memories were less intrusive. Days dumped into a great river of personal mythology. Days that in later years, will overflow their banks at every opportunity. It used to be that you were not particularly mindful of the first fall of snow. Now as you sense the universe can grow cold, those first swirling flakes and frozen puddles have found their place. They make the coming winter seem a more predictable and unhurried affair. When the darting frenzy of the hummingbirds dwindled at the end of summer, and the feeders you had been so careful to keep topped up, needed less and less attention, only then did you know how the end would come. Not in some brilliant windfall of glory and self sacrifice. But in those ancient memories that come unbidden, crowding out the focus youth had been so careful to acquire, and making smooth what never was.